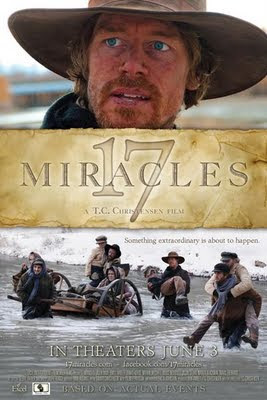 For our single's group FHE (Family Home Evening) this week we went to see 17 Miracles at the Scera theater. 17 Miracles is the story of the Mormon Willie Handcart Company coming west to late in the year. It's centered around Levi Savage, who feared that leaving late in the season would lead to despair and death. He was right but the movie accounts for the miracles as well. It was pretty moving and so sad to think about what they had to go through. Of course I was a bit teary. I try to be a quiet crier if I am going to cry. At one point I sniffled a bit and I could feel a pair of eyes looking at me. I glanced sideways to see my friend Melissa and sure enough she was looking at me. She asked incredulously, "Are you crying?" My reply was, "Shut up."